Please click on the tab for your campus for more information about how to order a transcript, letter of certification, or diploma. Current students have online access to SIS, our Student Information System, from where they can download an electronic unofficial copy of their transcript. It can be found on the Registration menu (top left side) under MyGrades, View Unofficial Transcript. Official electronic transcript can be requested online through The National Student Clearinghouse. Make sure to allow a few days for processing. This option is not available for Bologna Center Diploma students who completed prior to AY 2015/16 and MAIA students who completed prior to AY 2007/08. Those students should request a hardcopy through this form. The SAIS Europe Registrar’s Office issues official transcripts as hard-copies in a sealed envelope. In order to request an official copy, please fill out the online form. Please allow a few days for processing. For current students and recent graduates (<1 year) this service is free of charge. Alumni are charged €5.00 per copy. Statements certifying student status may be necessary for various purposes (loans, social security, health insurance, military service, etc.). Current Students and Alumni may request a letter verifying their dates of enrollment and degree program by filling out the paper form and emailing a scan of the signed form to Sais.eu.registrar@jhu.edu. Please make sure to allow a few days for processing. International Student Identification cards are available in Bologna at C.T.S. (Centro Turistico Studentesco-CTS). The fee is approximately €10 and the card is valid from January through December of each year. To request it, one photograph and a valid SAIS ID card are required. To request an official duplicate of your diploma, please download and complete the Duplicate Diploma Order Form found here. Students who completed the SAIS Europe Diploma in International Studies (formerly known as Bologna Center Diploma) in the AY 2015/16 or later may also use the above form. Students who completed it prior to AY 2015/16 may use the form found here to request a re-print, if the need arises. Click here to request hard copy or electronically delivered transcripts online. Current students may submit their requests online here. Former students/alumni may download and complete the Enrollment/Degree Verification Letter Request found here. Third party companies may visit the National Student Clearinghouse for enrollment and degree certifications. Please submit your request to "Johns Hopkins University – SAIS, 002077-01" for expedited processing. In adherence to FERPA guidelines, our office must receive signed consent before we release your transcript. Therefore, we do not process transcript orders over the phone. Additionally, our office does not process credit card transactions, so requesting your transcript online at the National Student Clearinghouse may be most expedient. Can someone else pick up my transcript for me? Yes, provided that our office is notified in writing who will be receiving the transcript and he/she shows photo ID. Is the electronic transcript an official transcript? Click here to request both electronic and hard copy HNC transcripts. Johns Hopkins University now offers Certified Electronic Diplomas (CeDiploma)! More than a paper diploma. The CeDiploma holds your 12-digit CeDiD* [link to Features page]. The CeDiploma can be independently validated through the JHU website by future employers, State Government Licensing Agencies and any other entity that wishes to validate your achievement. 1) DIPLOMA VALIDATION PAGE: To ensure the Degree information is still valid, we highly recommend you visit the JHU official validation website to perform an additional validation. 2) DIGITAL SIGNATURE: A CeDiploma from JHU is digitally signed by CeCredential Trust. When the document is viewed through Adobe Reader or Acrobat versions 9.0 or higher, it will reveal that a Digital Signature has been applied to the document. Attn. Mac users: When viewing an official electronic credential from JHU, the software utilizes Adobe’s secure certified PDF technology and therefore may only be viewed using the free Adobe Reader or Adobe Acrobat 9.0 or higher. The default Mac preview application will not display the document correctly. If you have any further questions, or need additional help, please email sais.dc.registrar@jhu.edu. For all inquiries, we ask that you kindly include the CeDiD number, and the name of the Alumni as it appears on the CeDiploma. You can obtain your CeDiploma through SIS Self-Service, which has a direct link to CeCredentialTrust, a third party vendor of JHU. Can I obtain an electronic copy of my diploma if I graduated prior to May 18th, 2016? Currently CeDiplomas are only available for JHU 2016 graduates and forward. There are two ways to validate your electronic diploma (this also is noted on the second page of the diploma). Validate through the School website, http://web.jhu.edu/registrar/diplomas/validation, or by clicking the link on the 2nd page of the CeDiploma and typing the necessary information where indicated. If you are using Adobe Reader or Acrobat 9.0 or higher, you will be able to view the Digital Signature which is shown at the top of the PDF, and is part of the overall security of the document. If the Digital Signature shows a Blue Ribbon, it means that document has not been tampered with; any other symbol signifies the document cannot be trusted. 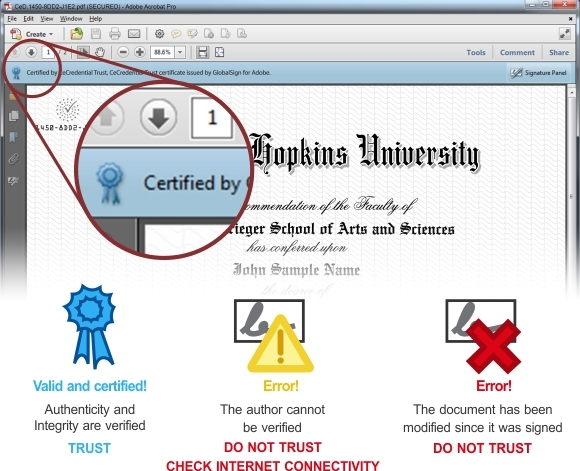 CeCredential Trust is the branded name of the digital signature that JHU vendor uses to digitally sign the CeDiploma. Requests from current or former students with unmet obligations to the University (e.g., holds) cannot be honored. To resolve financial holds, contact saisbilling@jhu.edu. If you wish to browse the courses offered at the school, please click here. Select “Nitze School of Advanced International Studies” for the full list of course offerings at all campuses. Select an Academic Department for specific area courses. Select a Term (i.e. Fall 2015). Select a Campus (i.e. Washington DC Center). Note that course evaluations and syllabi are only available to admitted students. Future offerings may be subject to change. Admitted students can register for open classes via SIS. SAIS Europe MAGR students will be automatically registered for cohort courses. For advising on your course selections, students should contact the Office of Academic Affairs. Please click on either the 'SAIS Europe' or 'Johns Hopkins SAIS DC' tab for more information. The final exam period for regular courses is defined in the Academic Calendar. Exams are not scheduled on the same day of usual classes, so students need to keep themselves available for the entire examination period. The examination schedule is normally issued to students during the first part of the semester. Students are requested to take published dates into account when planning vacation, trips, employment, internships and interviews, etc. ONLY UNDER EXTENUATING CIRCUMSTANCES SPECIAL ARRANGEMENTS MAY BE GRANTED. The rules to follow during examinations are defined in the honor code. Students should also note the detailed regulations included in the student handbook (e.g. religious holidays). To ensure a comprehensive background in international relations, MA candidates must pass examinations in at least TWO of the four core subjects. Those who choose to concentrate in European and Eurasian Studies must pass THREE Comp(rehensive) Exams in that area instead of the Core exams. Students are expected to have passed two Core exams by the beginning of their third semester. Students may prepare for a Core examination by studying on their own, auditing, or enrolling for credit in a Core course. If a student takes a Core course for credit it is treated as any other course: the exam must be taken at the end of the course and the grade obtained is final. If a student opts to prepare on their own or attend a Core course as an auditor, they need to register separately for the exam and only passing grades are entered on the transcript. Passing grades are registered as “P” or “HP” (High Pass). Those who fail a Core exam twice are required to enroll in the Core course for credit. Registration will be made available online through SIS around 10 days prior to the corresponding exam date. Students will be informed by email about the deadlines. Core and Comp exams are scheduled during the orientation period at the beginning of the academic year and during the examination period as defined in the Academic Calendar or some days earlier. If students are registered for a CORE course for credit they do not need to register for the corresponding exam. All other students that want to take the exam need to register (including auditors). In order to register for a CORE or COMP exam through SIS (Registration -> Class Search), please use the following codes (which are different from the class codes) and select the current term (“SB Fall” or “SB Spring”). 1. When are Core Exams held? Click here for the Core Exam Schedule. 2. When are final exams? How do I know if I have a final exam? Click here for the Final Exam Schedule. Final exams are scheduled on the same day of week and generally the same time slot as the class normally meets. Not all classes have final exams. Please consult your course instructor and the posted exam schedule. 3. How can I register to take a core exam? Registration is available via SIS for Core Exams. Students are encouraged to contact the program office who administers the exam (denoted by the authoring faculty) for any special considerations. 4. How can I take a language proficiency exam? Information on language proficiency exams can be found on the Language Studies Program Office web page. Some courses at SAIS Europe have limited enrollment. These are also referred to as ‘capped’ courses. Information on which courses have limited enrollment will be provided prior to registration for each semester. The reasons for limited enrollment vary and range from the wish of the professor to have a small seminar group; the availability of certain restricted reading materials; and the structure of the course requiring student presentations. The course bidding process was introduced to provide a fair structure through which students would gain access to a limited class when it was oversubscribed. Students must successfully bid on an oversubscribed class in order to remain enrolled in that class. NOTE - Students who choose to enroll in a ‘capped’ course should attend and stay abreast of the work/readings for an alternative course in case they cannot attend the course with limited enrollment. The available Bid Points are allocated as follows: MA, MAIA, MIPP and Diploma students receive 1000 points entering their first semester and 100 additional points after each successfully completed full-time semester (4 courses). Students with advanced standing of 16 credits get 100 extra points once approved. Dual degree students get 100 extra points once they return to SAIS from the partner institution for their last term. Part-time students are allocated points to reflect their part-time status. Non-degree students are not allowed to participate in Bidding. Students who are registered for oversubscribed ‘capped’ courses may use some or all of their bid points to attempt to gain entry to the class. The class is filled by those bidding the highest number of points. If a student bids and gains entry into a class, those points are deducted from their total bid points. No points are deducted if a student is unsuccessful. Students who registered for courses that went to bid but did not submit a bid are treated as having bid zero points. If two or more students have the same bid at the cut-off of enrollment, then a lottery is used to determine which of these students will be enrolled in the class. Students who bid more than their available points will not gain entry to the class. In some cases it will be announced that concentrators have enrollment priority. Concentration changes will be considered for Bidding only if approved (or requested) before the end of the course registration deadline. All courses are identified with programs by the first three numbers of the course. If the course is cross listed, only those students in the program identified by the first three numbers will be considered having priority. Dual concentrators are given priority only in their “primary” concentration. Bidding usually takes place during Change of Registration (“Drop-Add”) so that students can settle into classes as early as possible. The Bidding form will be available on the BCWeb. The Registrar’s Office will send all the required information about bidding by email to the students JHU email account when appropriate. The enrollment limit for capped courses is indicated on SIS, where courses will be visible from around Mid-July. Below you may find bidding reports from prior terms with information on what classes went to bid, the number of students registered, the number of students who had to bid, bid range values and clearing prices. This is your main resource in creating a strategy for upcoming rounds of bidding. NOTE - Clearing prices vary from term to term and year to year depending on demand. All limited Economics courses (start SA.3%) were eligible for bidding in Round 1 only! There is no 'shopping' for Econ courses! A report of limited courses with enrollment numbers will be posted here during the week leading up to bidding. 1. Why does Johns Hopkins SAIS have bidding? The course bidding process was introduced to provide a fair structure through which students would gain access to a class when it was oversubscribed, and in the case of the foundation economics courses of Microeconomics, Macroeconomics, International Trade Theory and International Monetary Theory, to balance attendance in various sections of the same course. 2. What is Round One of bidding and what is Round Two? Round one of bidding includes ALL limited international economics courses, a select few limited enrollment courses and foundation economics course that need balancing. Round two of bidding is for the remaining limited enrollment courses that may become oversubscribed at the end of the first week of classes. If a course is limited yet does not become oversubscribed it will not go to bid. Students must check this page for the bidding dates and deadlines and it is their responsibility to monitor this site for updates regarding bidding during both round one and round two. 3. What strategy should I use for bidding on a course, what resources do I have? At the bottom of the page are reports that provide detailed historical information on what classes went to bid, the number of students registered, the number of students who had to bid, bid range values, clearing prices, and special rules. This is your main resource in creating a strategy for upcoming rounds of bidding. It is also helpful to check the enrollment reports to see how far oversubscribed classes are, which may help you gauge your chances of getting in to the class via bidding. 4. What if I do not get in to the course I bid on? Students must successfully bid on an oversubscribed class in order to remain enrolled in that class. All students should have alternate courses selected for any limited enrollment courses in the event that they are unsuccessful in their bid. If a student does not gain entry in to a class they bid on they will not lose those bid points. 5. What if a ‘limited’ class doesn’t go to bid? Limited classes that do not fill up prior to bidding will be available for enrollment once the Add/Drop period opens after bidding. Any available seats will be filled on a first-come, first-served basis and those classes will be closed once the enrollment reaches the limit. 6. How do I know how many points I have? MA students receive 1000 points entering their first semester and 100 additional points after each successfully completed full-time semester (4 courses). MIPP students receive a total of 1100 points and Ph.D. students receive a total of 1300 points. Prior to the start of bidding each semester an email is sent to each student that states the amount of bid points they have going in to the subsequent round. If there is any question regarding the validity of this amount the students must contact SAISBids@jhu.edu by the date noted in the email. All bidding communications from SAIS will be sent to your JHU e-mail account (JHEDLID@johnshopkins.edu). Please make sure to monitor that e-mail account regularly for any messages regarding the bidding process. Students must be registered for the limited, oversubscribed course in order to submit a bid. If you register for a limited course, always have an alternate course selected in case the limited course goes to bid, and your bid is not successful. If you are trying to decide between two classes that meet at the same time during the week of online add/drop, excuse yourself from one to visit the alternate. Second year MA students do not need to bid on courses in their concentration unless the course is oversubscribed just with second year MA students and MIPP affiliates within that concentration. REVIEW the Bidding Course Enrollment Report to determine if you need to bid. Dual concentrators are given priority only in their “primary” concentration. All courses are identified with programs by the first three numbers of the course. If the course is cross listed, only those students in the program identified by the first three numbers will be considered having priority. No priority is given for International Economics courses. Affiliated MIPP students get priority seating in 1 course within their affiliated program beyond a required foundation course. They must bid on all other enrollments. See MIPP FAQs for information on bidding benefits and applicable programs. At least one MIPP student who bids will be accepted into a limited enrollment course where entry to the class is determined by bidding. Please review “Understanding SAISbids” section below for general information on the bidding process. Click HERE to see all of the special rules for Spring bidding. Click HERE to see all of the important dates and times related to bidding. SAISbids is used at both the Washington and Bologna campuses. MA students receive 1000 points entering their first semester and 100 additional points after each successfully completed full-time semester (4 courses). MIPP students receive a total of 1100 points and PhD students receive a total of 1300 points. Points may be used to attempt enrollment in oversubscribed courses each semester a student is at the school. Students who are registered for oversubscribed limited-enrollment courses may use some or all of their bid points to attempt to gain entry to the class. The class is filled by those bidding the highest number of points. If a student bids and gains entry into a class, those points are deducted from their total bid points. No points are deducted if a student is unsuccessful. Students who registered for courses that went to bid but did not submit a bid are treated as having bid zero points. If two or more students have the same bid at the cut-off of enrollment, then a lottery is used to determine which of these students will be enrolled in the class. Students who bid more than their available points will not gain entry to the class. To bid on more than one course, you must access the bid form separately for each bid. If the total number of points you bid for all bids exceeds your total bid point balance, all of your bids will be disregarded. Furthermore, only bids from JHU email addresses will be considered, so please make sure that your JHU address is activated. § Example 1: A first-year MA2 student used 400 points during the fall semester to gain entrance to a class. That student currently has 1000+100-400=700 points available to bid. § Example 2: An MIPP student who has completed one semester at SAIS was assigned 1100 points upon entry to the MIPP program. That student bid 200 points during that first semester to gain entry to a class, but was not successful. Therefore, this student did not use those 200 points and still has the 1100 points available for future bids. § Example 3: A second-year student attended her first year at the SAIS Europe. That student did not bid on any courses in Bologna during her tenure. As an MA3 student, she has 1000+100+100=1200 points available to bid this semester. § Example 4: A student enters the shool as an MA1 and during his second semester he is accepted to a dual-degree program. Upon entering his third semester, he is now an MA4. The foundation economics classes of Microeconomics, Macroeconomics, International Trade Theory and International Monetary Theory are generally offered in multiple sections each semester. The goal is to have relatively balanced enrollment between the sections of the same course. Bidding may be necessary to preserve balance in enrollments. If balancing is necessary, then bidding will occur in Round 1. Any foundation economics class that goes to bid for the purpose of balancing enrollment will have an enrollment limit set across all sections, and any section that meets that limit will be closed to further enrollments. NOTE- Clearing prices for past terms are provided so that students can see the relationship between clearing price and excess demand for a course section. Past results do not represent a specific bid amount that will ensure entry into a class. Clearing prices vary from term to term and year to year depending on demand. These reports are provided as a tool for students to weigh their bidding options. Current or incoming students with previous federal student loans may be eligible for an in-school deferment. Students are expected to keep track of their student loans and maintain contact with their loans' servicers. Usually, student loan servicers will be automatically notified of in-school status, but students should always check with their loan servicer to make sure. The school participates in the National Student Clearinghouse, which is an industry-sponsored consortium that was created to simplify the enrollment verification and deferment processes for schools. The Clearinghouse is responsible for providing status and deferment information, on behalf of the school, the guaranty agencies, lenders, servicers, and the Department of Education’s National Student Loan Data System (NSLDS). 1. Call the lending agency to see if a deferment form was received between the time the Clearinghouse supplied the information and the lending agency sent the collection letter. 2. If, after calling the servicer, it still appears that the deferment has not been processed, you may call the Clearinghouse at (703) 742-7791 and ask for a Student Service Representative. The representative will verify the date on which the Clearinghouse received the deferment form, the date the deferment was certified and mailed, the enrollment status that was certified, and where the form was sent. 3. If an emergency exists, for example, you are 150 days delinquent and being threatened with default, the Clearinghouse will intervene on your behalf by faxing another enrollment certification to the servicer. Further, it will work with the servicer to ensure that the form is processed on a high-priority basis. If you have any questions concerning the School’s participation with the Clearinghouse, please call The Registrar’s Office at (202) 663-5708. Johns Hopkins School of Advanced International Studies (SAIS) is approved by the District of Columbia Higher Education Licensure Commission (HELC) for the training of veterans and the widows and children of deceased veterans under the provisions of the various federal laws pertaining to veterans' educational benefits. Information about veterans' benefits is available at www.gibill.va.gov. Students eligible for veterans' benefits (excluding Post-9/11, Chapter 33 and Vocational Rehabilitation) register and pay their University bills in the same manner as non-veteran students. Reimbursement is made by the Department of Veterans Affairs on a monthly basis. The amount of reimbursement is governed by the student's rate of pursuit calculated by the number of courses taken during a semester. Students eligible for Post-9/11, Chapter 33 veterans' benefits register in the same manner as non-veteran students. A partial tuition payment is made by the Department of Veterans Affairs directly to the university. The amount of payment is governed by the student's eligibility established by the VA. The student is responsible for the remaining tuition. JHU-SAIS participates in the Post-9/11 GI Bill® Yellow Ribbon Program. This program provides funds to veterans in addition to the standard tuition benefit of the Post-9/11 Program. In order to qualify, veterans must be pursuing a Master’s or Doctoral degree with SAIS, must be enrolled in a full-time course load, and must be certified by the VA to be eligible for 100% of the Post-9/11 GI Bill® benefits. Individuals on active duty status are NOT eligible for the Yellow Ribbon Program. If your status changes at some point during your studies, you may be eligible for increased benefits for the subsequent academic period. Students receive 50% of their Yellow Ribbon Award from SAIS and 50% from the VA. The Yellow Ribbon Program benefit amount for the 2018-19 benefit year (starting 8/1/2018) is $12,000. For specific information on this program, please contact the VA Certifying Official, SAIS Registrar’s Office at 202.663.5617 or by e-mail at jbates@jhu.edu. Full-time enrollment is 12 or more credits, or the equivalent of 3 full-semester, non-language courses. For students enrolled in the Global Policy Program or at the Hopkins Nanjing Center, 9 credits is considered full-time. At JHU-SAIS, courses that do not carry credit hours cannot be counted for VA certification. For incoming MA students, the Preterm session does not carry credits and is not a certifiable period. Additionally, Language courses hold no credit value. Therefore, if you intend on taking a language course during the summer term, it cannot be certified for VA benefits. Once admitted to the University, the student must apply for benefits with the VA. Students are encouraged to apply for VA benefits online at www.gibill.va.gov by clicking the “Apply for Benefits” icon in the center of the page. The VA will issue a “Certificate of Eligibility” to the student indicating benefit rate and duty status. A copy of the Certificate of Eligibility must be sent to the VA Certifying Official, Office of the Registrar, JHU-SAIS 1740 Massachusetts Ave. NW Washington, DC 20036 or by e-mail to jbates@jhu.edu. Alternately, one may complete an Application for Program of Education or Training (VA Form 22-1990) from the Department of Veterans Affairs at www.gibill.va.gov. A copy of the completed application along with a certified copy of the DD-214, (not required for ACTIVE DUTY), is sent to the VA Certifying Official, Office of the Registrar, JHU-SAIS 1740 Massachusetts Ave. NW Washington, DC 20036 or by e-mail to jbates@jhu.edu. As a final step, admitted students must log into SIS Self-Service to confirm your intent to use VA benefits to help fund your tuition. DC and Nanjing students click the Billing tab, select Third Party Billing, and choose U.S. Department of Veterans Affairs. SAIS – Europe students click the Personal Info tab, select Summary, and click Add a Third Party Payer, then choose U.S. Department of Veterans Affairs. Next, read the Student Acknowledgement Section and check the box to acknowledge and sign. Click submit. Students who have previously used benefits and are transferring from another university or college will need to complete a Request for Change of Place of Training (VA Form 22-1995) from the Department of Veterans Affairs at www.gibill.va.gov. A copy of the completed application along with a certified copy of the DD-214, (not required for ACTIVE DUTY), is sent to the VA Certifying Official, Office of the Registrar, JHU-SAIS 1740 Massachusetts Ave. NW Washington, DC 20036 or by e-mail to jbates@jhu.edu. Eligible dependents of veterans should refer to www.gibill.va.gov to obtain the correct application form depending on the dates of service of the veteran. Students who received veteran's benefits at JHU-SAIS the preceding semester and plan to re-enroll with no change of objective should inform the Certifying Official at the time of registration that they wish to be re-certified under the provisions of their original VA Form 22-1990. Students receiving veteran's benefits must take courses that lead toward the exact objective (a specific degree) on the original VA application. Otherwise, they must submit a Request for Change of Program (VA form 22-1995). Students utilizing veterans' benefits must let their Certifying Official know immediately of any change in their status or program that might affect the amount of their payment from the VA. If they fail to do so, the Department of Veterans Affairs will seek reimbursement from the student for any overpayment. If your status changes at some point during your studies, you may be eligible for increased benefits for the subsequent GI Bill benefit year. Questions regarding a change in benefit rate/duty status may be directed to the VA Certifying Official, SAIS Registrar’s Office 202.663.5617 or by e-mail to jbates@jhu.edu. Students may be certified 30 days prior to the academic period start date. Students MUST be registered in their full course load in order to be certified. It does not matter if you add/drop courses, as long as your credit load remains the same. The standard full-time course load is 4 full-semester, non-language courses. The minimum full-time course load is 3 full-semester, non-language courses. For students in benefit chapters where payment from the VA is made directly to the school (Post-9/11, Voc Rehab), an anticipated sponsor payment is posted to your account after your enrollment is certified with the VA. You are responsible for any remaining balance, and may be blocked from making registration changes until that remaining balance is paid. The DOD will no longer authorize Tuition Assistance for classes for which a member is also receiving benefits under the Montgomery GI Bill – Selected Reserve program (chapter 1606 of title 10, United States Code), Reserve Educational Assistance Program (chapter 1607 of title 10, United States Code), or any other GI Bill program other than the Montgomery GI Bill – Active Duty program (chapter 30 of title 38, United States Code) or the Post-9/11 GI Bill program (chapter 33 of title 38, United States Code). Students using the Post-9/11 GI Bill® program in addition to TA will have the amount of their TA subtracted from their tuition burden prior to certification with the VA. If you intend on using TA to fund a portion of your tuition, you must notify the VA Certifying Official at the time you submit your VA paperwork. Failure to do so may result in the student incurring a debt to the VA. Continuation of VA payments depends on the student's meeting the University's academic standards for all students. The student must also meet any standards of progress which may be established by VA regulations. The school fully complies with the Federal Family Educational Rights and Privacy Act (FERPA). Please click here for the JHU policy regarding FERPA. 2. The right to request the amendment of the student's education records that the student believes is inaccurate. One exception, which permits disclosure without consent, is disclosure to school officials with legitimate educational interests. A school official is a person employed by the University in an administrative, supervisory, academic or research, or support staff position (including law enforcement unit personnel and health staff); a person or company with whom the University has contracted (such as an attorney, auditor, or collection agent); a person serving on the Board of Trustees; or a student serving on an official committee, such as a disciplinary or grievance committee, or assisting another school official in performing his or her tasks. A school official has a legitimate educational interest if the official needs to review an education record in order to fulfill his or her professional responsibility. Upon request, the University discloses education records without consent to officials of another school in which a student seeks or intends to enroll. **Though our office can release any of these categories of directory information without the student's consent, it is customary for our office to exercise discretion and release only the indicated information. Under the provisions of the Family Educational Rights & Privacy Act (FERPA), students have the right to withhold the disclosure of directory information. A student may refuse to permit the designation as directory information of any or all of the categories of personally identifiable information with respect to that student by delivering a written request to the registrar within the first two weeks of the fall, spring, or summer terms or anytime thereafter. Please consider very carefully the consequences of any decision to withhold directory information. Should you decide to inform the University not to release this information, any future requests for such information from non-University persons or organizations (prospective employers, loan servicers, landlords, etc.) will be refused. Students should be aware of the possible consequences of withholding directory information, such as missed mailings, messages, and announcements, non-verification of enrollment or degree status, and exclusion from the commencement booklet/program. The University will honor your request to withhold any "directory information" but cannot assume responsibility to contact you for subsequent permission to release them. Regardless of the effect upon you, the University assumes no liability for honoring your instructions that such information be withheld until you submit written authorization to release the non-disclosure hold. Please note that submitting a request to withhold directory information does not impact or change what is visible in JHED. A separate procedure must be followed if you want to exclude Johns Hopkins Enterprise Directory (JHED) information. You must login at http://my.jhu.edu, click on the MyJhed tab at the top of the screen and follow the directions under JHED Functions/Set Online Visibility. If you intend to work/study/live abroad, you may be asked to verify your academic credentials by obtaining an Apostille or by having your credentials “authenticated” or “certified”. What is this process, and why are you being asked to do it? You are being asked for an Apostille/Authentication because someone in another country wants to authenticate the signature and seal of an approved public official, the notary. Because countries often have different legal requirements for authenticating legal documents and public records, the Hague Apostille Convention Treaty was conceived in 1961 as a way to certify that a document authenticated for use in one country is certified for use in another. If you are being requested to provide an Apostille, the receiving country participates in the Hague Convention Treaty. However, not all countries are party to the Hague. For these countries you will be requested to have your credentials authenticated or certified. The Hague designates US state-level Secretaries of States as Competent Authorities to issue the Apostille. The Secretaries of States in turn appoint public notaries to certify the signatures on certain documents. The Apostille is issued by a Secretary of State after that document has been notarized by an appointed public notary. The document is now certified for use in the intended country with no further authentication by the US Department of State. For non-Hague countries, Secretaries of States also provide authentications. Rather than issue an Apostille, the Secretary of State will issue a certificate of authentication. That certification must then be submitted to the US Department of State, which will then issue an Authentication Certificate to make that document eligible for use in the intended country. For more information on the Apostille/Authentications please visit the US Department of States Document Authentications website or view the The ABCs of Apostilles brochure published by the Hague Conference on Private International Law. IMPORTANT: For your academic credentials the Apostille/Authentication authenticates the seal and signature of the notary public, not the registrar. Having your credentials notarized only creates a public record of the notarial act. The notary signature does not bestow any additional esteem or honor on your academic credentials nor does it make the document “more official” for most standard purposes (domestic job or graduate school applications). Without a notary seal and signature, your official transcript and diploma are still official documents and need no further endorsement if used domestically for non-legal purposes. You, or your representative, will send the notarized transcript to the District of Columbia Office of Notary Commissions & Authentications. After you have followed the appropriate procedure and paid any necessary fees, the DC Authentications office will provide the Apostille/Authentication for your document. For non-Hague countries, the DC-issued Authentication must then be submitted to the US Department of State Office of Authentications for the final Authentication Certificate. If your transcript is notarized outside of the District of Columbia, you will need to send the document to the Secretary of State of the state where the notarization was performed. Please visit the National Association of Secretaries of States for appropriate procedures for each state. Determine if you wish to have the original or a copy of your diploma notarized. Our office recommends you have a copy of your diploma notarized to prevent damage to the document. Also, please know that the Registrar’s Office does not keep copies of diplomas. For each graduate, only one diploma is created—the diploma that is given to you upon graduation. If you have lost/damaged your original diploma, you may request a replacement for a fee from the Registrar. Verify with the intended recipient if a specific school official (the Registrar, the Dean, etc.) is required to attest to the diploma’s authenticity. Bring/email a high-quality photocopy/scan of your diploma. The public notary may witness the Registrar or yourself attesting to the authentication of the original document or its copy. If you will use a non-SAIS notary, you may be asked to present the original diploma. You, or your representative, will send the notarized diploma/copy to the District of Columbia Office of Notary Commissions & Authentications. After you have followed the appropriate procedure and paid any necessary fees, the DC Authentications office will provide the Apostille/Authentication for your document. If your diploma is notarized outside of the District of Columbia, you will need to send the document to the Secretary of State of the state where the notarization was performed. Please visit the National Association of Secretaries of States for appropriate procedures for each state.